I work full-time, and do a couple of other activities that take me away from the house and planting a vegetable garden, I also have friends to visit across the country... so when I put time into my garden, it is busy, and usually hard work, as the weeds romp in my absence. I have a long garden, and space at the end for my vegetables. I'd love to grow asparagus, but am put off because there are very few places in the whole of my garden where Bind Weed (Convallaria) is not a major problem, and I know you have to leave the crowns undisturbed. Up till now, I have just pulled up the vine where I can, and dug up the root where possible, although it deliberately grows around woody plants and where you can't reach (in my opinion). This year, for the first time, I'm on the warpath with the weedkiller. My other problem weeds are dock, dandelion and creeping buttercup, although couch grass is waiting to become a problem. The garden and vegetable patch had bramble all over it, and they pop up now and again. I have no solutions for them, except persistance! My final parasite is wire worm. I have been told that once the grass is removed, they should clear up, but I don't know how far away the grass needs to be from the site for this to be effective... my paths are grass-covered. I've also been told that the life-cycle is 6 years, so if any grass helps them, I could be only a loosing battle. They usually get my potatoes, and sometimes carrots and jerusalem artichokes. I hate seeing them writhing in the vegetables. 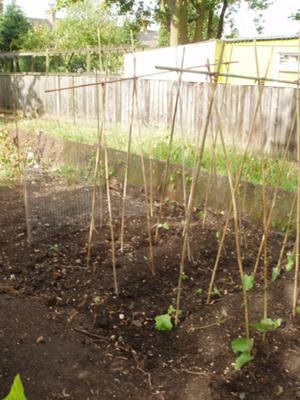 This year I am growing the following: salad leaves, cabbage, courgette, rocket, raddishes, onions, peas, purple french beans and runner beans. I had a very successful weekend when I prepared all the beds, although probably didn't mulch enough compost into most of them (only for the beans and courgettes) - and I sieved one bed out to about 9 inches (23cm), because it was so full of stones, broken glass, bits of nails and all sorts. That was hard work, but rewarding to see the outcome. The potatoes went in that bed - pink fur apple and sante (allegedly disease-resistant variety). I am waiting to get some tomatoes from a plant fayre at work. Everyone brings in cuttings, extra seedlings etc. from their garden or vegetable patch, and we swap what we want, and donate some money for charity - it is really successful! - there's usually a glut of tomato plants too. I will be donating spare courgettes. For the first time, I am keeping a gardening journal (on paper - imagine!) that I bought from Paperchase, I think it might encourage me when I can see the progress I am making. Comments for The Difficulties Of Being Busy... And Loving Your Vegetable Garden! My goodness you seem to be plagued with problems my dear. Gardening can be a full time job when there are so many problems to deal with so I recommend a good week in the garden dealing with these and by this I mean getting really into the root system of weeds and getting the blighters out! You are right, persistence is probably the best solution, however, you sound quite busy so will need to prioritise your life if you wish to have a problem free garden. I spent years battling with brambles and stingers and now have very few due to some seriously hard work removing, my fore arms were a mess for weeks!! You've done a great job and once you start harvesting those crunchy fresh vegetables then you will know it will have all been worth it. Good idea keeping a journal!